1. 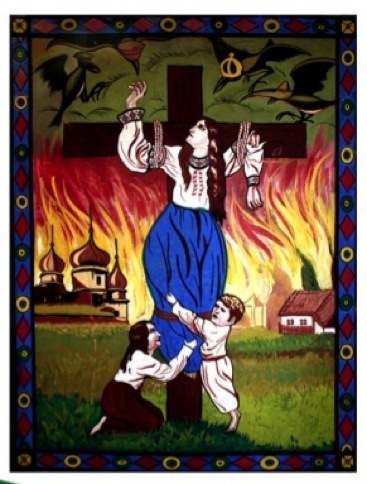 The Holodomor serves the interests of anti-Stalinists and Ukrainian nationalists. While true, logic compels me to point out that convenience or utility does not have any bearing on the truth of an event. As for Stalin, the Holodomor is one of many real events that can be used to demonstrate his “deliberate perfidy” and that of his regime. More on that below. 2. Famine was common in Eastern Europe, just as it was in British-ruled India. Again, this does not have any bearing on the truth of the case at hand. The fact that there are many atrocities committed or disasters endured does not make any one of them less true or despicable. 3. Of the “hundreds of accounts” the author has read on Soviet collectivization, he has not seen any “credible” arguments made regarding the intentionality of the Ukrainian famine. Before becoming I priest, I was an intelligence analyst. I spent many years studying the Soviet Union and, later, studying how intelligence failures occur. The decision about a source’s credibility is often more a result of whether what she says matches what we expect to hear than the result of an objective analysis of her access and trustworthiness. This is as true for studying collectivization as it was for studying Iraqi WMD. There are many serious and reputable Sovietologists that the author ignored. 4. The preponderance of evidence (“thousands of accounts”) barely ignore or barely mention the crisis in Ukraine. A weighted scale always reads heavy. The Soviet propaganda machine was a weighted scale, and it used Potemkin villages, controlled access, and staff writers to great effect (not just about the Holodomor, but about many things). As I used to teach young analysts, a lie told a thousand times by a thousand liars does not make it any more true. And yes, the journalists who, like Mr. Duranty of the New York Times, participated in this cover-up, should have their actions condemned. Again, as point #2, the quantity of wicked deeds done does not make any one of then excusable. 5. Stalin’s program of collectivization of agriculture was a necessary prelude to both the successful industrialization of the Soviet Union and to the defeat of Hitler’s Nazi hordes a decade later. First, the most basic comparative analysis shows that there are ways other than collectivization to support industrialization. Collectivization was motivated by the ideological requirements of communism, both in the economic and cultural realms. Second, the logic of the argument is flawed: the later utility of collectivization does not speak to the truth of the tragedy or the maliciousness of its implementation. The assumption that “the end justifies the means” is repugnant on a moral basis as well, but I will address that below. 6. Bad weather, bureaucratic excess, sabotage, and the resistance of rich peasants all contributed to the tragedy of 1932-33’s famine. A look at the harvests before, during, and after the Holodomor clearly shows that weather was not a major factor in the famine: the imposition and brutal execution of artificially high quotas were the primary causes of the Holodomor. In most of the world, such actions are criminal, whether the mobs that perpetrate them are deputized or not; and resisting actions that would bring economic ruin is seen as just and fitting. The closing of Ukraine’s border to both emigration and food aid was, like the quotas, more than bureaucratic excess: it was targeted class and national warfare. To this point, my critique of the letter in question has largely been objective and amoral. But my final point is unambiguously moral. Stalin’s regime, indeed the entire Soviet experiment, was wicked and did enormous damage to all who suffered beneath its tyranny; not just to the millions of Ukrainians who died during the artificial famine, and not just to those who lived with the memory of watching a third of Ukraine’s children and a quarter of its people die in excruciating and completely avoidable pain: the Holodomor and numerable other evils committed in the name of “progress” ate at the souls of all who supported and apologized for them. I will never understand why people feel the need to excuse evil, but I reckon that part of the problem is that many of them do not admit that it is real. To those that do, the truth of the Holodomor is evident. Some authors compare those who would deny the evil of the Holodomor to those who would deny the evil of the Holocaust; while this may be appropriate, I think that lets us all off too easy. More fitting comparisons that should move everyone out of their ideologically-generated comfort zones are the excuses generated to justify the thousands of deaths resulting from overly-aggressive foreign policies and the millions of equally avoidable deaths resulting from abortion. None of these atrocities are necessary, none are morally defensible, and all result in immeasurable pain and suffering. The “end” of social and economic progress does not justify wicked means any more than do the equally dubious ends of a “pure race”, victory in the “Global War on Terror”, or a woman’s “right to chose”. PS I submitted this letter to the Providence Journal and posted it to their website.